Telling stories is always more fun in a group. What if we could all come together to tell one enormous story, just five seconds at a time. Pandora is an experiment in social storytelling that lets creativity run wild. Pandora is a small box that does two things. The first, is that it will tell the current user the most recent 10 seconds of the story. Following that, it will allow them to add five seconds of their own to it. Pandora is portable, intuitive, and cute -- the perfect recipe to get everyone to engage with it. 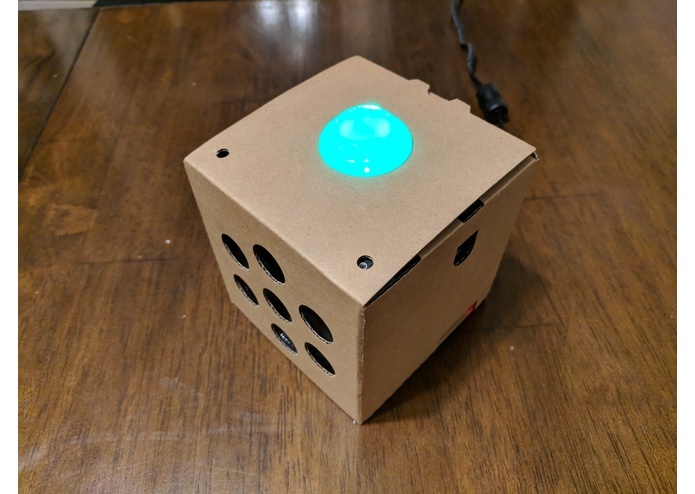 Pandora is built with a Raspberry Pi on top of the AIY platform. The actual logic of Pandora is written in Python, using libraries such as libdub to ease the process. Pandora features an incredibly simple and intuitive 1 bit interface. It has a single button that functions as both input and output, as well as a high fidelity text-to-speech synthesizer for relaying instructions. We hope to find a semi-permanent home for Pandora where anyone passing by can engage with it and add to the story.